Not wanting to under-romanticize rural living with my recent rants about natural pests, we also acquire new members to our household from time to time. Like my bathroom tree frog that accommodated me each morning by leaping from the basin overflow to a hanging towel and watched me brush my teeth—a fond attachment ending flat-tragic in the door jam with only green, flipper fingers showing. Ahh! We become such saps when nature favors us with her trust. And almost always, it is the machinery of our progress that leads to their demise. 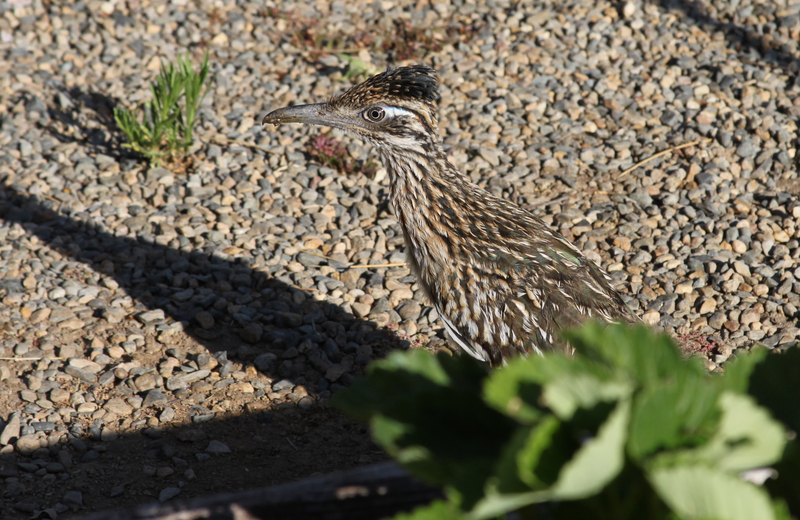 Identifiable by his drooping right wing, Wy-lee arrived with this year’s hatch of roadrunners, claiming the garden and immediate yard as his. Fearless and trusting, he’s after the snails, bashing them senseless and shell-less against anything hard with his beak before consuming our escargot. Predictably, he arrives from somewhere when we’re in the garden. Robbin followed him around yesterday evening with her camera. 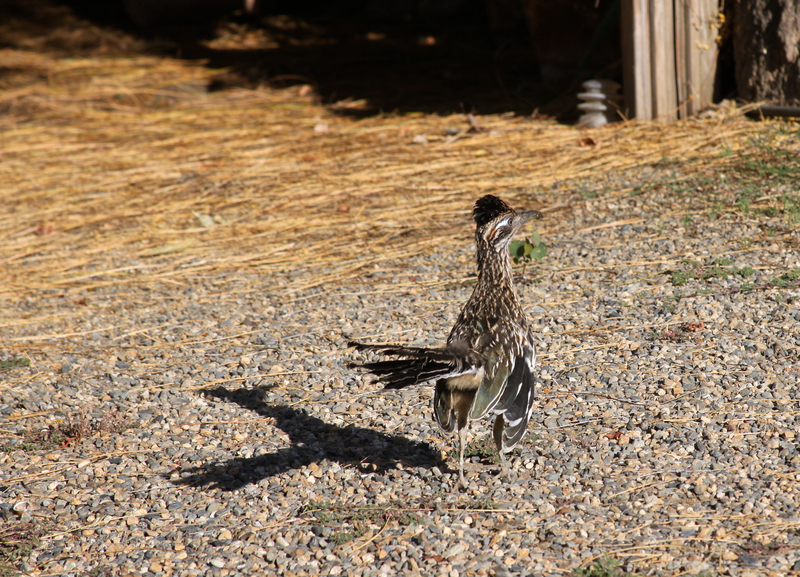 I love roadrunners! Try not to think of their delight in eating quail eggs…but they’re still cool birds! 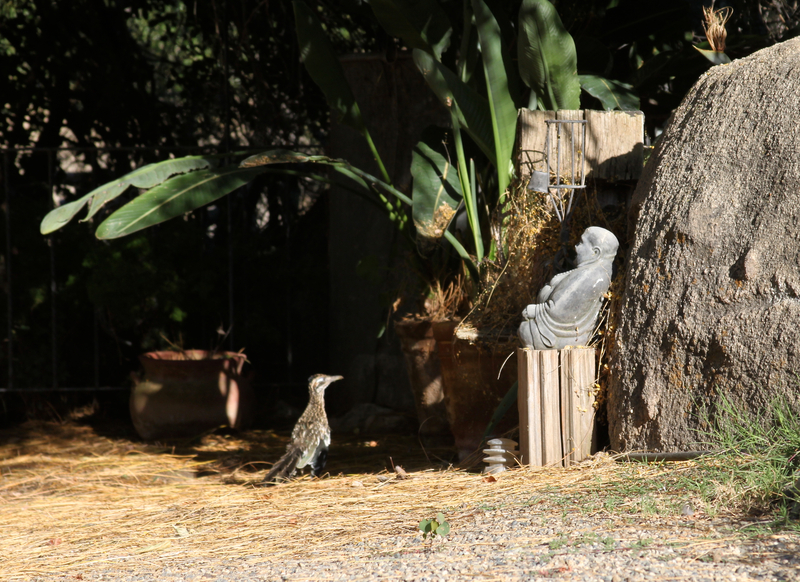 Totsie, you may be pleased to know that on one his recent wanderings through the garden, Wy-lee ran into an adult pair of quail with their entourage of babies. Robbin watched the male intimidate Wy-lee with some severe tittering, top notch bobbing, while the covey disappeared with the female into the thick cover.